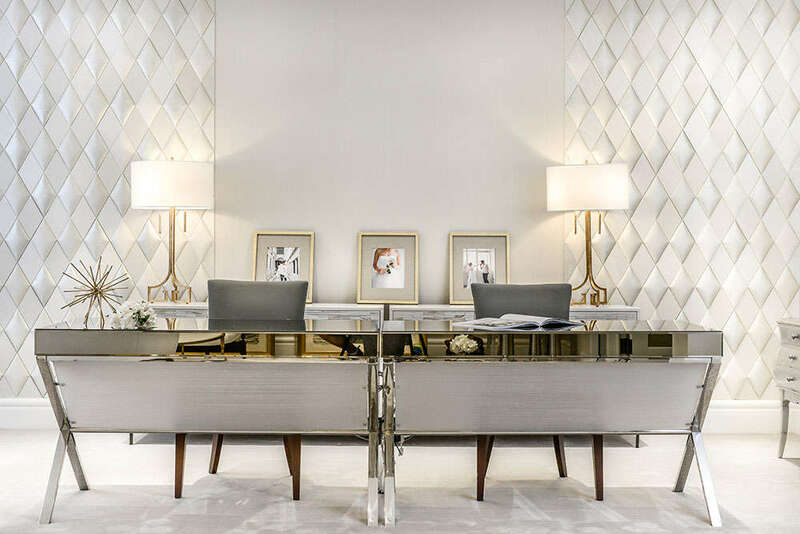 Wallcovering and flooring, while increasingly posh because of the burgeoning economy, have remained relatively conventional. When I set out to research into building materials and finishes, I wasn’t sure what I’d find. But these highly innovative products and prototypes are a welcome surprise. Enjoy! Psychedelic flooring that is pure clean fun! 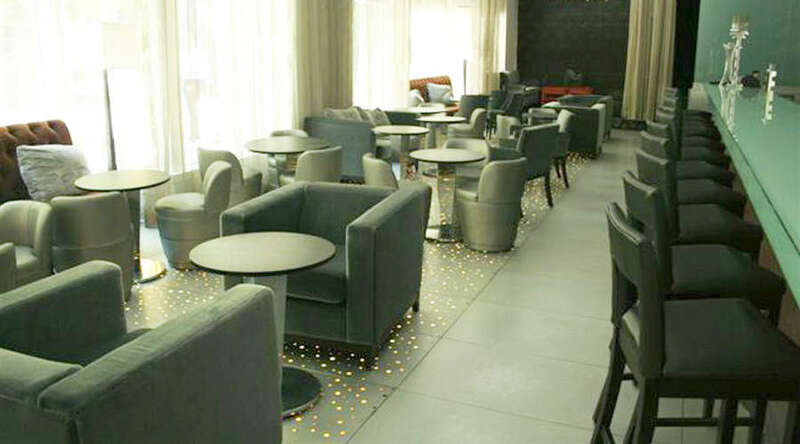 Liquifloor floor tiles are made of durable layers of PVC with a transparent top layer. Between the layers is a colorful gel-like liquid, such as magenta shown here. When someone steps on the tile, the liquid swirls around the feet and creates dynamic floor art. Nothing like an upholstered wall to dress up a space. Bet you can’t tell these sumptuous diamond mosaics are of faux leather! By mixing together regular and padded tiles in 5 different textures & shades of white, NappaTile has created a 3-dimentional design that is strikingly elegant. Options such as stitched or button finish in addition to over 250 colors allow these peel & stick tiles to be used in countless ways. Mineral board backing ensures fire safety for use as wallcovering. Turning tiles into night lights is like killing 2 birds with 1 stone! 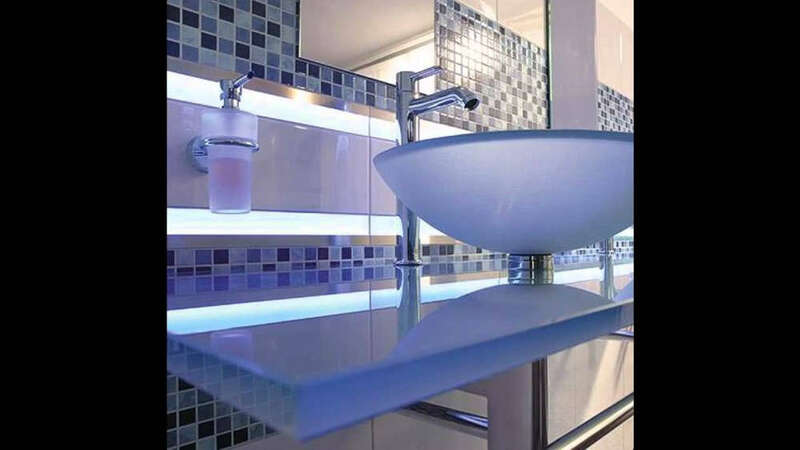 These tiles can display single color or light changing LEDs, and can be used on floors, walls as well as ceilings. These amazing luminous glass borders in multiple colors are 40 x 5.5 cm, intended to co-ordinate with 40 x 30 or 40 x 70 cm tiles. Elisa Strozyk pioneered the use of wood in textiles, creating soft flooring as well as fabrics for furnishings and fashion. Wood veneer is first cut by hand or laser into geometric shapes and then manually applied to a substrate, in this case a piece of fabric, to create the unique textile. Though the material is soft and pliable when laid out flat, it can be shaped by hand into a 3D form. 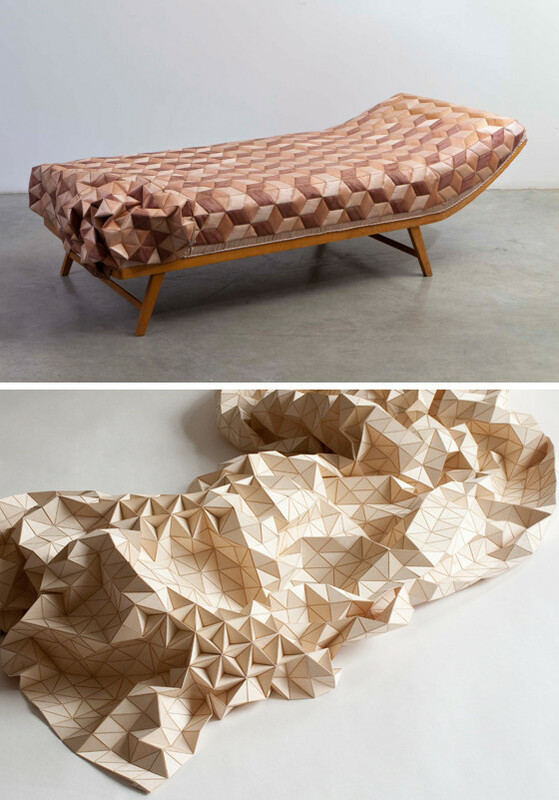 If this eye-catching material seems Escher-esque but also vaguely reminiscent of marquetry, you know why! This 50’s daybed got a facelift when Elisa upholstered it with her innovative fabric, which resembled a cross between marquetry and quilt. Her collection of ‘wooden carpets’ produced by Böwer shows the product’s versatility: it can be variously laid flat, rolled up, or scrunched into a ‘floorscape’ as desired! 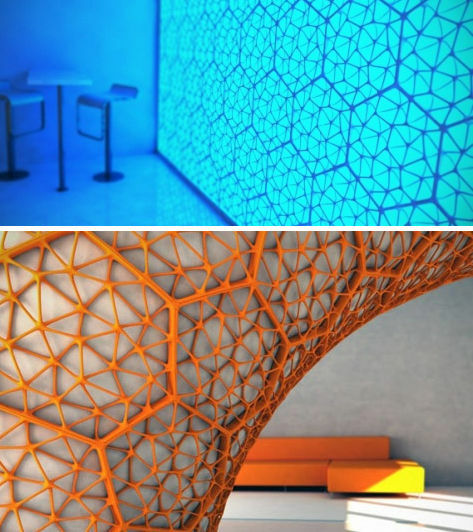 A striking space divider that showcases the power of 3D printing. Thanks to Selective Laser Sintering Technology, Janne Kyttanen’s flexible, modular Macedonia Space Divider can look ethereal while maintaining structural integrity. Applicable for indoor & outdoor use, the colorful screens are highly adaptable to flat or curve surfaces and can be used as a ‘decorative skin’ on any wall or surface. A totally custom flooring solution for anyone who dares to be different! Granted it takes enormous amounts of resources to produce aluminum, Alumafloor is made of 50.56 percent recycled content and being aluminum, at the end of life, it is 100% recyclable. Suitable as floors, walls and stair components, everything can be made to any size, shape or thickness. Similar to another recycled aluminum product, Alumafloor’s sleek look is a great fit for the Silicon Valley – with the right budget! A wallcovering that can also pull extra duty as light source and artwork – a brilliant idea whose time has come! 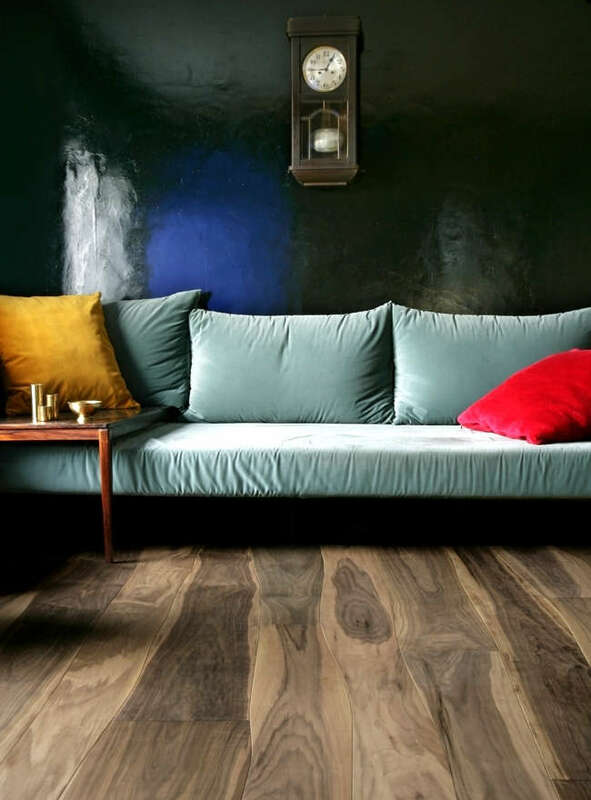 For those looking for an organic look, check out this live-edge flooring where no 2 boards are alike! Available in maple, oak, ash, cherry, and walnut, Bolefloor’s floor boards are cut along the curved lengths that follow a tree’s natural growth. Production of the flooring is like creating a giant jigsaw puzzle. It requires special technology to scan and mill the wood so the pieces will align correctly while maintaining a free-form look. It’s magic!? Watch closely and you’ll see the green vines in wallpaper ‘blossom’ as the temperature by the silver radiator rises. Nothing more entertaining than watching flowers grow on your walls. Artist Shi Yuan’s wallpaper reacts to heat, whether that’s from the sun or the radiator. The green vines will start blooming with the activity and color intensity proportionate to the rise in temperature. Now crank up the heat and you’ll be in a virtual conservatory! How about a glowing sports court? This cool floor is mainly for commercial enterprises, but you may find this exciting if you own a McMansion with sports courts!? This entry was posted in Fabrics, Green Design & Construction, Interior Design and tagged 3D Printing, Fabrics, Flooring, LED Lighting, Recycled material, Renewable Materials, Tiles, Wallcovering by Marie Chan. Bookmark the permalink.